I believe that Zoe has perhaps the most outstanding cat coat pattern I have ever seen and I have seen tens of thousands. I believe Zoe is a torbie which means tortoiseshell with a tabby pattern mixed in. You can see a faint “M” on the forehead. I know the flashlight has lightened the face but the pattern on the face is extraordinary and the way the pattern goes around the mouth is amazing. It is like a beard. 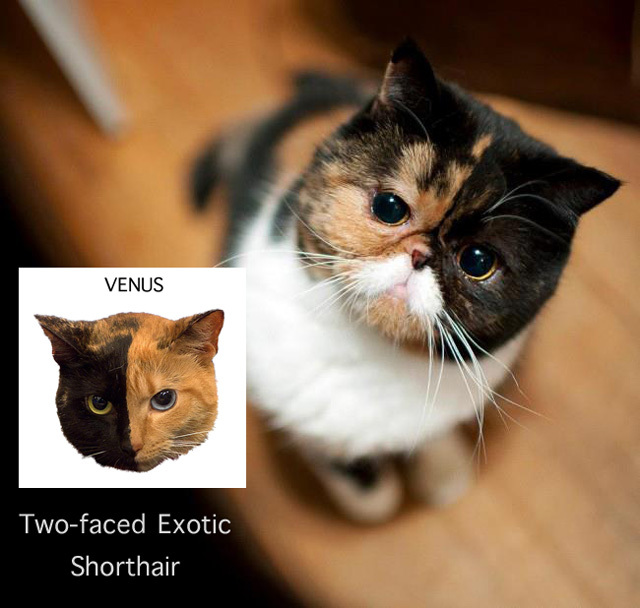 It is as extraordinary as the famous Venus two-faced cat. 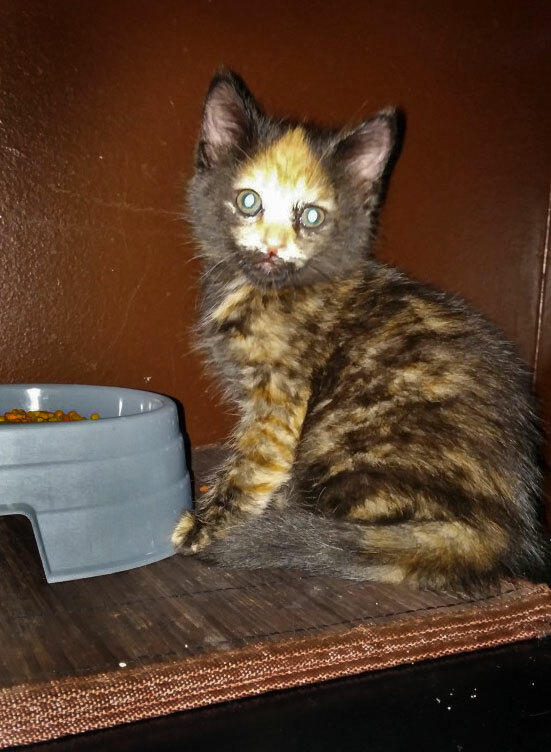 Venus is a tortoiseshell and the genetics that create this pattern does create sharp lines between dark and lighter fur. Often the line is down the nose forming what is called a blaze. 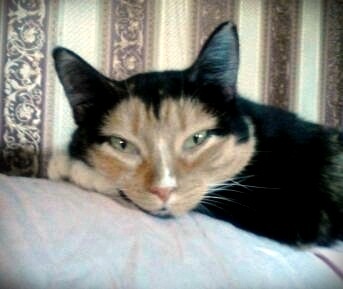 Have you seen a cat face like Zoe’s this before? This entry was posted in Cat Coats, Torbie and tagged blaze on tortoiseshell cats, cat coats, torbie cat, torbie cat coat, tortoiseshell cat by Michael Broad. Bookmark the permalink. Hi Cassie, thanks for sharing. Rebel is a great looking cat. I’d say she’s a torbie. 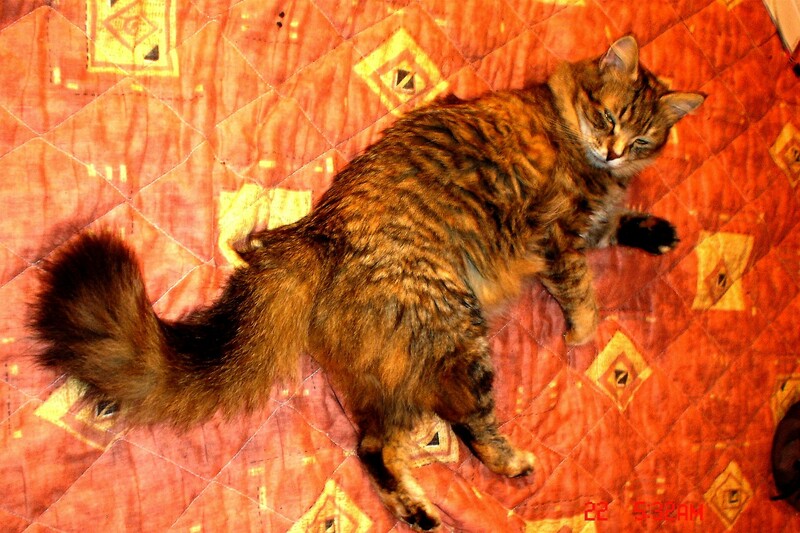 There is a distinct – what looks like – a mackerel tabby coat mixed with that unmistakable tortoiseshell coloring and even a blaze down the face. I think torbies are quite rare. Not sure why the picture loaded upside down! Here’s another of her paw. 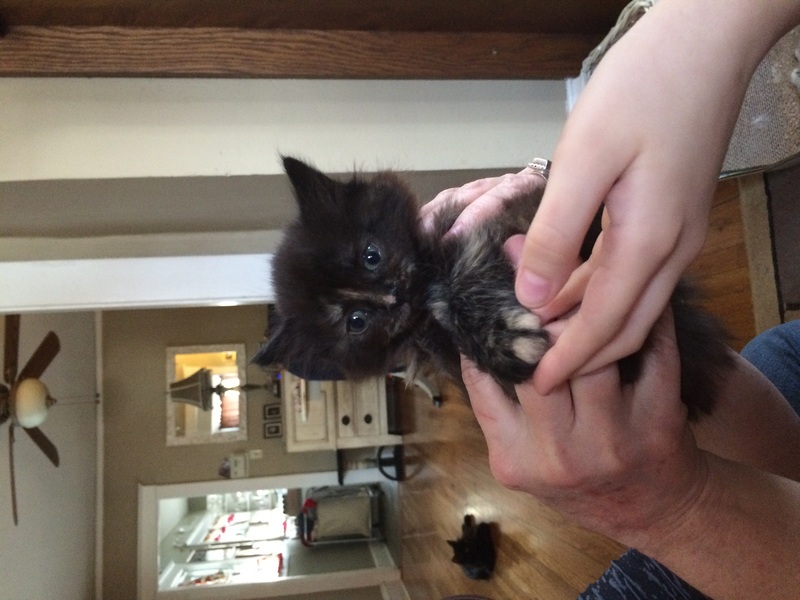 We are getting this little girl but aren’t sure what her pattern is called. 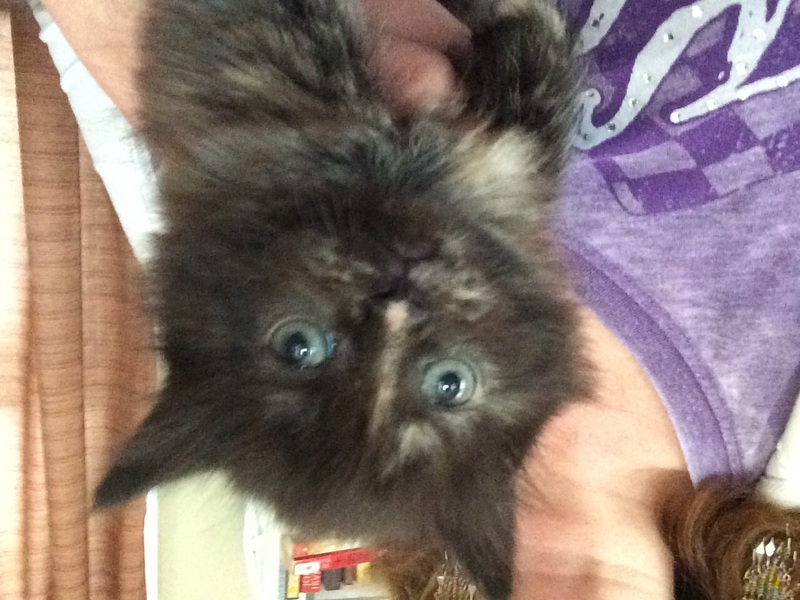 Is she a torbi or torti? She is siberian. In my opinion her pattern is ‘black tortoiseshell’. Hope that helps. Thanks for posting. I have a question for you Michael. My young “boy” here has some rather strange markings as far as I can tell. Was wondering if you could help me figure them out. I sent pictures along (at least I hope they loaded). It looks like he may be a broken brown mackerel(does have four colors[black, caramel, orange, blue] as well as white) “torbie” but I would like a second opinion. From what I have found that particular combination in a male is somewhat unheard of. His name is Spider because of a curious mark atop his head that looks just like a spider patterned in. I will try to get a photo of this soon but he likes looking at the camera instead of me being able to shoot right at the top of his head. 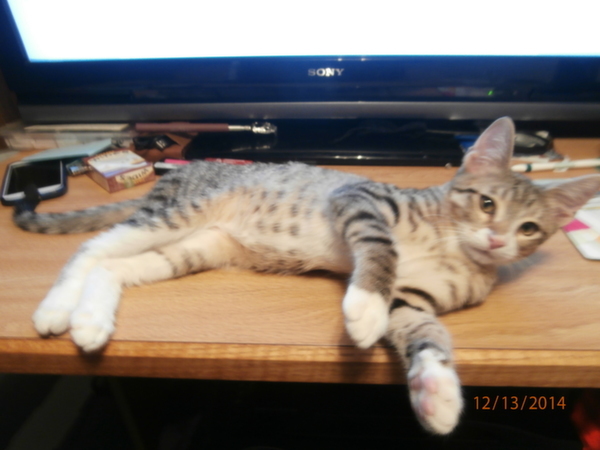 His mom is a tortie/ white, unknown what the sire is. Shawn, are you sure that he is a torbie? As you say, if he is then he is a rare cat but it can be quite tricky to tell the difference between a tabby cat with unusual markings and a torbie. What it can for me anyway. If the colour balance of the photograph is altered slightly to make it a bit cooler, from the photograph, I see a tabby and white cat with interesting markings. 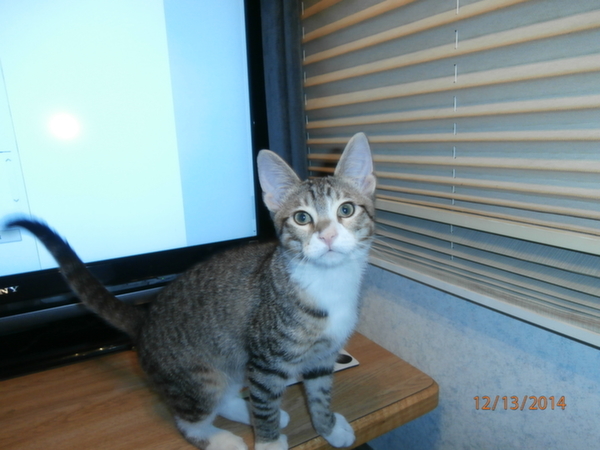 However, I’m sure you know this is that there is a wide range of tabby markings with variations on the same theme. A broken down mackerel pattern is as far as I’m concerned a spotted tabby. But there is a spectrum of markings between stripes and spots. 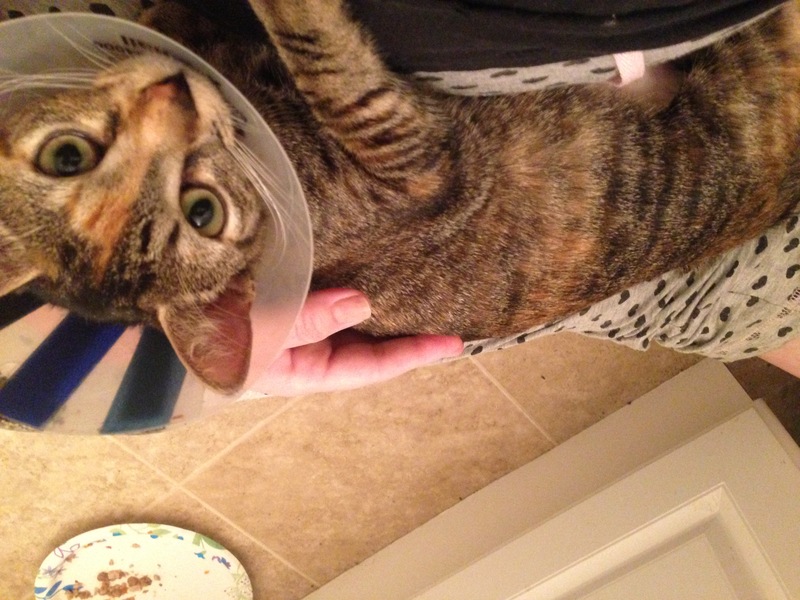 I have a page on the torbie. 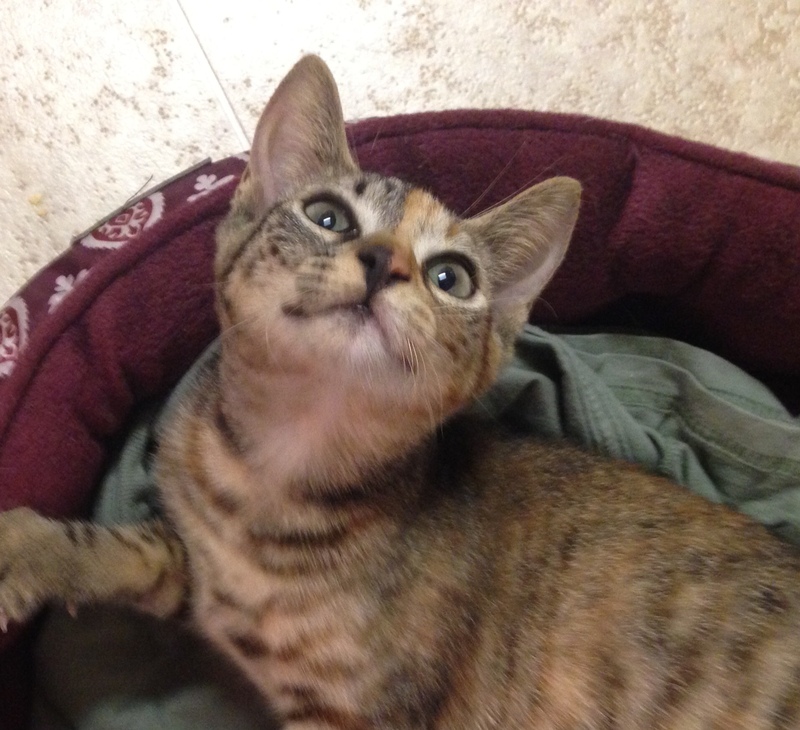 In addition, if you use the search option to search this website using the search term “torbie”, You will see a number of pages about this coat type. Thanks for visiting and asking. By the way, as for the spider pattern on the forehead my first impression about this is that it is the classic M tabby pattern but modified and these modifications do occur. Thank you for such a quick response Michael. As far as the camera coloring goes it has cooled the colors quite a bit in the pic as I can see. If you take a close look around his hind quarters it is a fairly present orange color. Plus instead of what I am used to seeing in a “tabby” the color between his stripes more than “hint” orange on his torso but at his shoulders and his chest are very prominent. The spider mark is actually set between his ears and me being somewhat arachnophobic sure gave me a jolt when I went to get him as a kitten (we have certainly overcome that presently). I have seen a few pictures of what is called a ” classic brown tabby” but none with the white that he has or the orange hew that is prominent. He does talk quite a bit and seems to have an attraction to water as well as taking to fetching very quickly. I am actively searching you sites and links as well as others. Here is another pic also. Almost like she is halloween costumed. I have never seen anything like this. As you say it is like she is wearing a mask or costume. When I first saw the photo (small format) I couldn’t understand what was going on. Then when I saw the full-sized version I was very surprised. Well, I don’t know about cats/coat patterns, but I’ve got an extraordinary pony coat pattern!!! When I bought this pony I didn’t notice the white pattern on her shoulder and I was exceedingly pleased/amazed when I found it. Later I realized that 7 years before I had bought her, I had made a house flag of a white dancing cat!!! That’s mystical. I don’t know horses but what a fine horse. 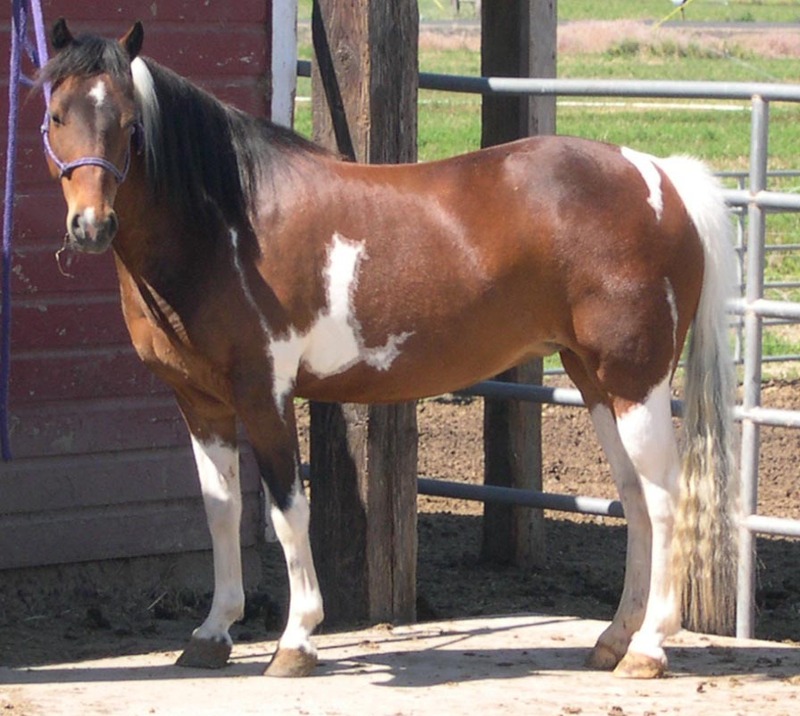 This is a piebald horse isn’t it? The piebald gene is present. The same gene is present in calico cats and bicolor cats. It creates the white bits just like that interesting white pattern. In the States we call it “Pinto”. It gets even more mystical! A friend of mine did an impromptu oil sketch of waterfalls in a forest and when you stand back from the painting it looks like this mare lying on the ground next to her black filly – this painting was done 8 months before I got her! I bought her to get a black and white filly from a Fell sire but she was already pregnant and actually delivered a black and white filly. Mystical stuff happens around my cats too. I like that mysticism. Perhaps there is something going on. We don’t know. Yes Zoe is a torbie because of the stripes visible in various places not just the M on the forehead. The unusual think is the light area on the front of the head. You might compare her to my Endora who does not have that light facial area. Maybe the flash gives an exaggerated impression. I am thankful you agree with me 😉 Phew. Your Endora is gorgeous. A rich pattern. V.special. You live with beautiful cats. Your always got Geogerous Cats Harvey!! All very unique coats indeed. I love the Exotic! Yes, the Exotic is psychedelic almost but for me the torbie is the star.